The fich finish and stylish contemporary design of the “Hayley” dining room collection transforms your dining area with an atmosphere of exciting details that command a presence within any decor. the select veneers are bathed in a dark brown finish that flows smoothly over the concave drawers and profile details to beautifully capture the refreshing contemporary design. With the classic look of antique nickel color hardware perfectly complementing the rich finish, this collection is sure to enhance any dining environment. 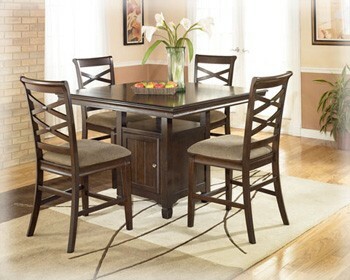 Complete the look of any dining room decor with the rich contemporary beauty of the “Hayley” dining room collection. The Great Holiday Sale! Save On All Furniture Styles! Save 5% to 15% on All Furniture and All Brands or Lease Any Item in the Store, Get $50 Off Your First Months Rent!